Though most people reading this have never heard of the master criminal Fantômas, there was a time when the character was internationally known. The star of a series of pulp novels, the character was created in 1911 by French writers Marcel Allain and Pierre Souvestre. The villain captured the imagination of the public and soon the pair had penned dozens of Fantômas novels. Eventually there were Fantômas comic books, TV shows, and, of course, movies. In 1913, soon after the series started, the French studio Gaumont bought the rights and pioneering director Louis Feuillade created a series of five feature films staring the dastardly villain. Restored in 1998, these silent movies have just made it to region one thanks to Kino. The entire serial of five movies has been released in a wonderful looking three DVD set that is a must-buy for fans of early cinema. Since this is a serial, with one movie leading into the next, sometimes with cliffhanger endings, I’ll give a brief synopsis of each one and then discuss the movies as a whole. Fantômas in the Shodow of the Guillotine (1913 54 minutes): The first movie introduces viewers to Fantômas, a wily criminal and a master of disguise. He takes up with Lady Beltham and murders her husband and hides the body. Investigating the disappearance of the nobleman, Inspector Juve along with his reporter friend Jérôme Fandor discover some clues that lead them to the body of the missing man and implicate a man named Gurn. 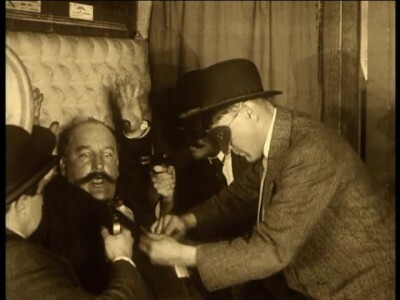 Gurn, none other than Fantômas in disguise, is quickly arrested, convicted, and sentenced to death. But being on death row under heavy guard isn’t enough to stoop the criminal genius. Juve vs. Fantomas (1913 62 minutes): A great film and the best in the series. Astounded at Fantômas’ escape, Inspector Juve becomes obsessed with capturing the criminal, especially after he robs all of the passengers in a train car and then crashes it (killing the people aboard) in order to hide the crime. Filled with action and suspense, this chase through the French countryside has just the right touch of humor to make it a classic. The Murderous Corpse (1913 90 minutes): What a wonderful title for a movie. This time a young man, Jacques Dollon, is framed for murder by Fantômas. Dollon is arrested and processed, then locked in a cell where he mysteriously dies. When his sister arrives at the police station to visit him, she’s informed of his death, but when they take her to see the body, it has disappeared! Who could not only kill a man in police custody, but also steal his body? Why Fantômas of course. Things get even stranger when a priceless necklace is stolen from a lady at a dress ball. There’s a fingerprint of the crook who took the jewels on the lady’s neck, and when it’s analyzed they find that it belongs to the dead Dollon. More crimes occur, and all with Dollons fingerprints at the scene. These films are very entertaining and have a strange surrealistic touch to them that is just wonderful. I have to admit that if it had been a straight cop and robber series I would probably have grown bored, especially with the way the movies were filmed (more on that later.) 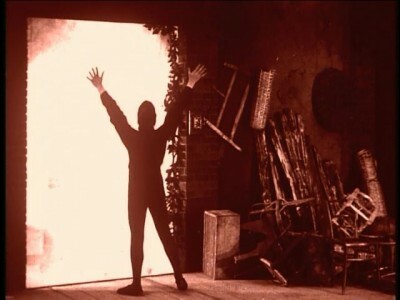 As it is, the weird movie logic that permeate these films adds a lot by both harkening back to a simpler time and by resulting in some wonderfully unusual scenes. A great example of this is when Juve overhears that Fantômas is planning on killing him on a particular night. What does the inspector do? He goes to bed as normal, but before he retires he dons a spiked vest and a pair of spiked arm bands. 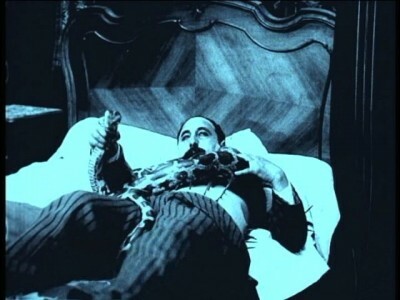 It’s the perfect defense if Fantômas is planning on killing him by putting a huge snake in his room, which is luckily what happens, but not so great of a defense if the villain was just going to shoot him. Another surrealistic element of these movies are the disguises that Fantômas (as well as Juve and Fandor) employs. When he puts on a beard and wig Fantômas isn’t just altering his appearance; he’s actually becoming another person with associates, friends, and a job. When Fantômas poses as a doctor, he has a residence and practice and is a respected member of the community where he’s living. When he puts on the guise of a businessman he goes to his office and calls in his secretary. It’s as if the act of putting on makeup not only changes ones appearance but also their lifestyle. These movies also have some creative and macabre aspects that never would have flown past the censors in the US. In one chapter Fantômas hides a body by plastering it inside of a wall. When he wants the body discovered, he drives a nail in the wall and blood runs out. In another chapter the criminal makes part of a disguise out of human skin. As has been implied, Fantômas is not breaking the law to right injustices like Robin Hood or even a gentleman thief like Arsène Lupin. He’s more of a megalomaniacal mastermind, a precursor to the villains that James Bond finds himself pitted against. Fantômas is willing to kill without remorse for the smallest reasons (which are sometimes absurd) and has a small army of criminals that are under him, ready to do his bidding even though he treats them horribly. It’s a wonderful touch that makes him seem larger than life, which he obviously is. These are old pre-WWI movies that were created when the art of movie making was still in its infancy. The grammar for telling a story on film was still evolving and seen today these movies seem static and stodgy. In these films, the story is told with an unmoving camera set for a medium shot which are intercut occasionally with close ups (of objects.. rarely faces or reactions.) It’s as if the viewers are watching the story unfold by peering through a key hole. It’s very similar to watching a play, and it’s easy to see how that style became the norm for a short while. The scenes tend to go on for a long time too. It’s as if Feuillade wasn’t sure how much he had to show to let viewers figure out what was going on. In one scene, a man is being fingerprinted by the police, and they show all ten fingers being inked and printed. While these might put off some people who haven’t seen a lot of silent movies, you quickly get used to the style, and that’s part of the charm of these movies. It’s also interesting to see how much Feuillade does with this simple and basic formula. There is one excellent scene where Fandor is trapped in a whicker basket. He cuts his way out with a pocket knife, the whole act being shown on film (though the film was sped up a bit). When he gets out, he wipes his brow and sits on the basket, relived to be free, only to find that he’s in a room with a dead body. It’s quite a surprising sequence that works well even within the confines of this early style. Having said that, I can’t help wonder as what Feuillade would have done with these scripts if he had filmed them a decade later. The audio on the original R1 DVD was pieced together from various sources and wasn't that impressive. This time the movies are accompanied by an orchestral score which sounds nice and full, a great improvement from the previous score. The audio quality is fantastic, with no dropouts or flaws that my ears could detect. I really enjoyed the 2010 DVD release of this series, and was very happy with the way the nearly 100 year old movies looked. The Blu-ray looks even better. This HD set uses Gaumont's 4K restoration from 2013 that was scanned from the original nitrate negative. It looks fabulous. The image has a very good amount of detail, the blacks are nice and inky, and the contrast is excellent. This is an impressive looking set. This set starts out with two audio commentaries by film historian David Kalat on the first two films. If you've heard his commentaries for the Mabuse films, you know what to expect: an interesting and thorough discussion of the films and their place in history. These were both great commentaries. The first covered the films and in the second he dealt with the history of Fant�mas and his influences on popular culture on both sides of the Atlantic. Kalat came to the microphone with a full set of notes detailing every aspect of Fant�mas and both tracks are well worth listening to. There are also a pair of Feuillade shorts, The Nativity (1910) and The Dwarf (1912) which are great to have. 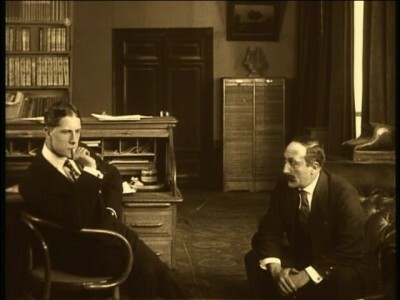 There's a ten-minute documentary on the director also: Louis Feuillade: Master of Many Forms. (None of these apparently are included in the R2 releases.) The extras are wrapped up an image gallery. This is a wonderful set of films. I really enjoyed Feuillade’s Les Vampires, a serial about a criminal organization that he made after the Fantômas movies, and I’ve been wanted to see these ever since I first screened that later work. The movies did not disappoint. With a tinge of surrealism and some very macabre moments these movies about a master criminal are immensely enjoyable. Highly recommended.